Francesco was hardly freed from his swaddling-clothes when his father, with that restlessness peculiar to exiles, removed the whole family from Arezzo to Pisa. There they stayed for about two years; and the little fellow's first tottering, baby footsteps were traced on the banks of the Arno. When he was three the decree of banishment was, through the influence of friends in Florence, revoked toward the Petrarch family, as far as Eletta and her son were concerned--and a part of their property was restored to them. The father was glad to secure to his dear ones a safer and more comfortable home than he could find for them in his wanderings; and Eletta, though she wept at parting from her husband, smiled again when relations and old familiar companions crowded round her to admire her gallant boy. 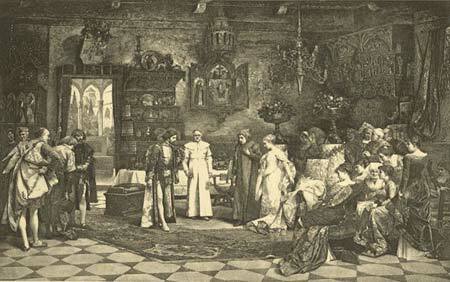 Petrarch and Laura introduced to the Emperor at Avignon. To explain the position in which they stood to each other, we must turn to the manners and customs of their age and country. Partly, perhaps, through the great reverence paid in the Roman Catholic Church to the Virgin Mary and other female saints, a sort of woman worship had, in the thirteenth century, spread through the south of Christendom. It was no unusual thing for a knight or a troubadour to select a certain lady, celebrate her in his songs, call on her name in the hour of danger, and wear her color in battle. The adored or the adorer might be either of them married--that made no difference; and the tender litany would sometimes run on for years, long after the idol's hair was silvered and her form more remarkable for plumpness than grace. Homage of this sort did not at all hurt the reputation of her to whom it was paid; not even her husband and children respected her the less for it. Some distinguished ladies had many devotees of this kind. On her side, the woman professed herself to have for her worshipper an equable, cordial feeling, which never went beyond sisterly friendship. Whether these platonic attachments ever slid into something warmer we cannot say. The history of the time gives us no examples of such being the case. As for Petrarch, Laura's beauty and the graces of her mind first awoke within him a romantic sentiment, which, according to the fashion of his brethren the troubadours, he at once begun publicly to proclaim in his verse. By degrees, through his thoughts constantly dwelling on her, his glorious genius created out of Laura Noves an ideal being who was woven into his deepest feelings, and his most aerial fancies, and his highest aspirations. What mattered it to him that the real Laura as years went on grew middle-aged and changed? His own Laura was gifted with immortal youth. Even after her death his imagination was still filled with her; and the sweet cadences in which he mourns her, and the more exalted strains in which he follows her to her home above, will always be regarded by his readers as some of the most precious gems he has left them. But Laura was not the poet's only theme. 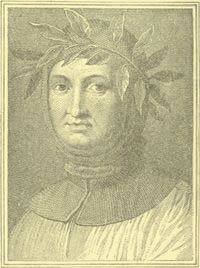 Love of his country was probably Petrarch's strangest passion. Italy was then a complete patchwork of small states, and it was the dream of Petrarch's whole life to see the Peninsula united from the Alps to Spartivento. In words burning as the summer suns which shine upon his native land, and powerful as the sudden storms which sometimes sweep over her shores, he spoke out this great longing of his life. He was also the author of many Latin poems, which were held in even higher honor than his writings in Italian. One of these Latin poems--that on Scipio Africanus--was a great favorite among his contemporaries, but to us it is the coldest and stiffest of his works. Petrarch's fame went on steadily increasing, until at thirty-seven he was universally acknowledged as the first poet of the period. When he had reached that age, there came to his quiet little home at Val Chiusa two messengers from two great European cities--namely, Rome and Paris--each of which begged him to accept the laureate's crown within its walls. The true Italian could not long doubt which offer he should choose. The Paris invitation was courteously but immediately refused, and proudly and gratefully Petrarch hastened to Rome. The act of receiving the crown of a poet laureate was, in those days of magnificent ceremonials, attended with much really regal pomp. Dressed in a robe of purple velvet glittering with jewels, such as suited the taste for splendor of the time, and such as in truth well befitted a literary prince, Petrarch was conducted with much public state through Rome to the Capitol, where he was thrice crowned: once with laurel, once with ivy and once with myrtle. The laurel meant glory; the ivy signified the lasting fame which should attend his work; the myrtle was the lawful right of Laura's poet. The Italian princes vied with each other in trying to get Petrarch to their courts, and in heaping favors upon him. He visited nearly all of them in turn. The life of a palace was perhaps not much more to Petrarch's taste than the life of a great city. But he was too much a man of the world not to be gratified by these honors, and besides, through the intimacy which he thus gained with the chief men of his country, he was able to work better toward his darling object, the unity of Italy. Many remarkable persons are briefly mixed up with the story of the poet in these days of his wanderings from city to city. We catch a glimpse of him being introduced by the pope to the German emperor Charles IV. at Avignon. We also see him grasping for a moment the hand of a man who, although no royal blood runs in his veins, looks in truth like a king among his fellows--Rienzi, the tribune. The middle of Petrarch's life was darkened by the loss of many friends. Laura died, struck down by the plague which raged in Avignon, and Petrarch, who, without counting all the ideal romance with which he had surrounded her, had for her a strong, warm friendship, mourned her very deeply. Several other friends of his youth at this time also passed away from the earth. The heart of the poet was cruelly wounded by these losses, but he sought comfort in work and study, and devoted himself more entirely to the interests of his country. As years went on the poet's love of a country life revived. He had done his utmost for Italy, but the result of that utmost had been nothing. The rest of his days should be given alone to literature. He therefore gave up frequenting courts, and bought a little estate at Arqua, a village among the Lombard hills, whither he retired. We like to fancy him in this pleasant home of his age, with his tall, lithe figure still unbent, his face, though careworn, still shining with intellectual light, his hand busy with the pen. Petrarch always loved the little elegancies of life, and no doubt, even in this country retreat, we should have seen him (unlike most of the literary brotherhood, whose very livery is untidiness) neatly dressed, and surrounded by as many pretty knick-knacks as the fourteenth century could afford. We should not ever have found his table very splendidly spread. Eletta's son kept the simple tastes acquired at Ancisa at her side, and liked best a diet of fruit and vegetables. Once the call of friendship drew him out of his solitude; Carrara, the Prince of Padua, who had been for many years the poet's friend and patron, had got into a mess with the Venetian Republic, and sent for Petrarch to get him out of it. This the poet's skill and eloquence very soon did, and then he went back to Arqua. Florence the Fair had a peculiar way of her own of doing tardy justice to her children. She wept over Dante's grave, and after many years she begged Petrarch to come and live in the home of his fathers, within her walls. But the poet did not go. He had grown to think all Italy his country, rather than one city. Besides, a brighter home was beginning to open on the old man's view. Eletta and Laura and many other dear ones waited for him there, and when he had been seventy years upon earth God called him to join them.